A romantic drama with some touches of humour, Affair With A Stranger is an uneven film, with adequate performances and decent construction but some strange choices and mainly predictable twists and turns. In Philadelphia, stage star Janet Boothe (Monica Lewis) throws herself all over celebrated playwright Bill Blakeley (Victor Mature), and then she spreads rumours that his marriage to Carolyn (Jean Simmons), who is back home in New York, is in big trouble. As the gossip spreads that they may be divorcing, the story of Bill and Carolyn's romance is recalled by their friends. Several years prior, Bill was a struggling writer with a gambling addiction and grand dreams of making it big. He meets model Carolyn in Times Square on New Year's Eve, and romance gradually blossoms. They eventually get married and she supports him even as his hopes for success appear to fade and he fritters away any small amounts of cash. One of his plays finally makes it to the stage, but it bombs. When Carolyn gets pregnant Bill is forced into a humiliating job as a waiter, but the couple's fortunes are about to change, with both triumph and tragedy around the corner. Directed by Roy Rowland, Affair With A Stranger tries hard to be interesting. Bill and Carolyn occasionally threaten to become an engaging couple, the motley crew of friends, neighbours and acquaintances who recall the story in flashback create an animated backdrop, and the struggle for success in the theatre milieu offers possibilities. But any sense of intriguing drama is let down by a ho-hum narrative. Most of the story's potential is wasted on a romance that labours to offer anything that is new or unique, leaving the film floundering in search of a purpose and feeling quite a bit longer than the brief 87 minutes. The central relationship features a fundamental disconnect never reconciled by the Richard Flournoy script: Bill is a largely wretched character, and what compels Janet to stick with him is not convincing. He is a liar from their first meeting, a gambling addict and living a life based more on hope than conviction. She holds their couplehood together as he remains a stranger, and it's questionable whether he is worth the effort. 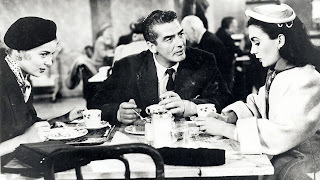 Victor Mature and Jean Simmons deliver reasonable performances given what they have to work with, but they are sometimes betrayed by mismatched moments that fall between the cracks of clunky romantic comedy and ineffective societal drama. A prime example is a scene involving Bill helplessly munching on fried chicken on his first visit to Carolyn's apartment. Rowland seems to go for inelegant laughs while portraying a desperately starving man callously targeting a woman as his literal meal ticket. Elsewhere, the ups and downs of their relationship offer little that is imaginative: she worries, he squanders, they stumble, rinse and repeat. The spirited supporting cast includes Jane Darwell as a restaurant owner, while a taxi driver (Wally Vernon), a newspaper kiosk merchant (George Cleveland), a big-time theatre producer and his wife (Nicholas Joy and Olive Carey) also take turns recounting parts of Bill and Carolyn's romance in flashback. The result is episodic, but keeps the film reasonably nimble. Affair With A Stranger hints at a better film that is unfortunately intercepted by an absence of composed crispness.